Improvements to Bardney Moorings are proving a big attraction for fish on the Witham – making the river’s environment even better. New structures have been attached to the underside of the moorings, giving fish a sheltered place to thrive. And thriving habitats are a great place for wildlife and visitors alike. The eight ‘refuges’ offer fish a hiding place from predators, a comfortable area to spawn, and a safe harbour when higher-than-normal water levels put them at risk of being washed away. It has been just three months since the project was completed by the Environment Agency, the Canal and River Trust and the Lincolnshire Rivers Trust but it is already proving a success, boosting the number of fish in the area. 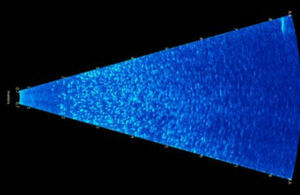 Underwater sonar images have revealed thousands of small roach fish. Over time, these will grow and move to other areas of the river, benefiting the Witham’s ecological status, as well as the catch for local anglers. The number of fish in the river also contributes to its classification under the European Water Framework Directive. To get a consistently good classification, we need to have lots of fish – and a good variety of them – right along the river. Projects like this help habitats to thrive. And a thriving river is good for the environment, good for people, and good for the local economy. The refuges at Bardney Moorings are part of a series of improvements to the habitat along the river Witham between Bardney and Boston. It is hoped similar schemes can be carried out in the future at further moorings along the river.